The five Mississippian period platform mounds at this site were built between 1100 and 1200 A.D. 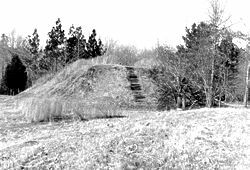 The U.S. Forest Service owns two of the mounds including the largest 17-foot-high Mound I. Both are open to public visitation. Archeological excavations conducted at the site in 1991-1992 by Mississippi State University revealed the foundation remains of a ceremonial temple or elite residence that once stood atop Mound I. 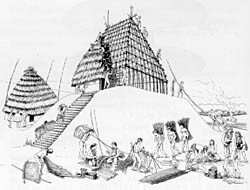 Structural remains were found on two other mounds as well. The scant presence of habitation debris in the areas between and adjacent to the mounds suggests that the site may have been occupied on a long-term basis by only a few people, probably those of high social rank. It is also possible that the site was completely vacant much of the time, visited by inhabitants of the surrounding region only on ceremonial or other important social occasions. Owl Creek Site is located in Tombigbee National Forest, two and a half miles west of Natchez Trace Parkway on Davis Lake Rd. From the Parkway, take the Davis Lake exit (milepost 243.1), about 18 miles southwest of Tupelo, Mississippi. Open to the public daily, free of charge.